Evaporative roof cooling will lower a roof's surface temperature 50-70 °F during the summer days. This amounts in an estimated 20-30% reduction of the buildings total heat load. In other words, the air conditioning lasts longer and works less, thus reducing the amount of energy required to cool the facility. 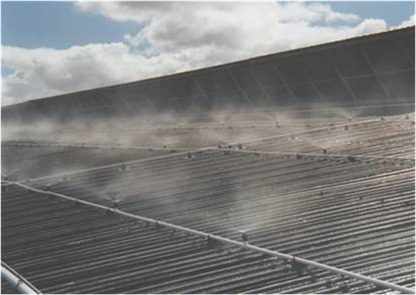 At the current average electric rates in California, an evaporative roof cooling system will have an estimated payback of 12-14 months by reducing the energy demand 20-30%. Other states will have paybacks in as little as 2 years. In the case of new construction, the total installed air conditioning tonnage can be reduced, with a further savings in capital expenditures. There are also circumstances when rooftop cooling supplies sufficient relief, eliminating the need for conventional air conditioning. UV-stabilized PVC piping connects a series of misting nozzles on the building's roof. Roof sensors provide feedback to the AutoCool computer, which in turn toggles solenoid valves that supply precise amounts of water to the roof. The AutoCool software maximizes the cooling and minimizes water consumption. Additionally, the AutoCool software provides on screen strip chart recording of temperatures as well as historical reporting. AutoCool also calculates water consumption, energy savings and payback.